From cover to cover Seeing Things features a series of interfaces: journeys in and out of real world situations; between real and mythical; between secular and spiritual; between objective and subjective; from the present into the future; between first order experience and seeing things through new eyes. Such boundaries require a range of crossings: doors, windows, gates, casements, ‘A crossing, for sure … the airport bus as death coach’ (DOD 324) between existence and annihilation. In Settings xxii Heaney set WB Yeats questions about the human ‘spirit’. A snippet Heaney met in a Yeats’ letter acts as the catalyst for a Californian experience that haunted him for a long time afterwards. Put simply Yeats suggests that those who have contact with the dead (see spirits) are marked by the experience, find human skin ( ) most coarse. Heaney too has recently suffered the loss of his remaining parent and discovered that things have a different texture! 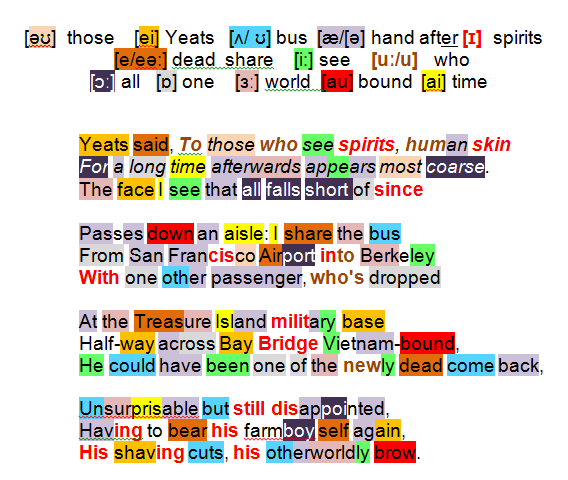 Heaney witnessed ‘a dead man walking’: returning by bus over Bay Bridge to his university post at Berkeley the poet came face to face with an unforgettable passenger (face … that all falls short of since) at the start of a personal ordeal – a conscript about to be pitch-forked into the hell of the Vietnam War (Treasure Island … Vietnam bound). Heaney completes the circumstantial detail. The power of the written word lies in the poem’s final four lines: Heaney turns the situation on its head, refiguring the conscript as a revenant from the war returning to the land of the living (one of the newly dead come back), someone who has experienced the full hell of it all (Unsurprisable), dejected (disappointed) at the prospect of picking up the threads of his previous rural existence (Having to bear his farmboy self again), having to live with its humdrum daily pitfalls (shaving cuts) … the marks of hell he has experienced in Vietnam etched on his face (his otherworldly brow).